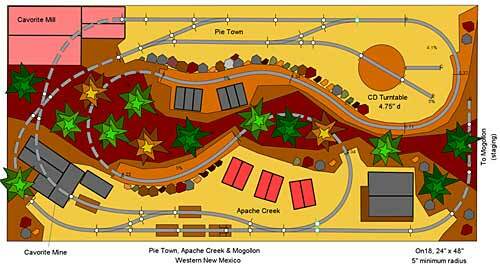 In this season of holiday display layouts, a continuous track plan is usually preferred over an end-to-end switcher. The circuit allows trains to run round and round through impressive scenery without requiring attention from an operator. So here are a batch of imaginative and interesting small layouts suitable for holiday (and other) use because they all have continuous track plans. They’re symbolized by the Celtic Knot behind our title, where a single endless strand forms virtually the entire design. 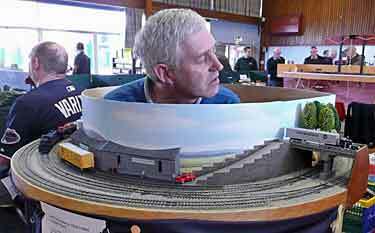 On 24-26 October 2009 the Hamilton Model Railroaders held their annual Model Railway Exhibition in Hamilton, New Zealand. The scene was dominated by a fair number of large, impressive display layouts (photo below) ranging in size from large enough to fill a bedroom, to a double garage, to a small auditorium. But this year the show also featured Something Completely Different: a display of micro and small layouts by Jonathan Scott, a local modeler who is often featured in these pages. Jonathan, along with his son, Edwin, exhibited four layouts (below), three of which have been featured in previous Scrapbooks — Zoo Table, a Z scale line built in an end table (#37); Sea Quarry, an N scale micro layout (#75a); and SprocketBahN, a micro-sized N-scale cog railway (#89a). 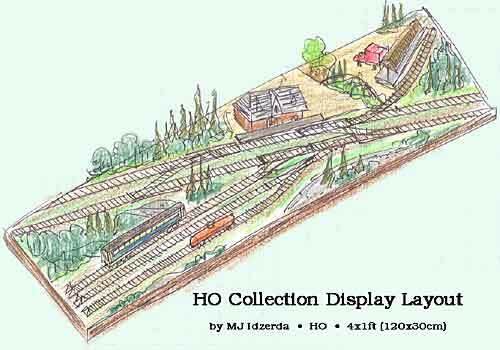 The fourth small layout was specially built for the occasion and was premiered at the show: the HO/OO scale Squiffy-Waterton, described below. 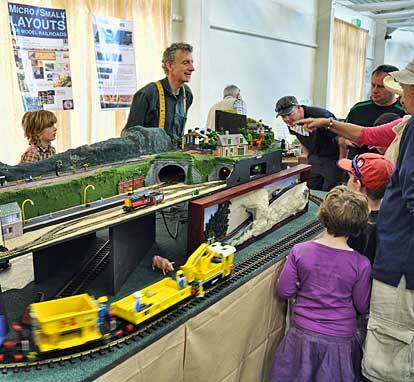 The Scotts tied the exhibit together visually by weaving a G-scale oval of track around and among the other layouts, showing that Large Scale trains can also be fun to use in small spaces. 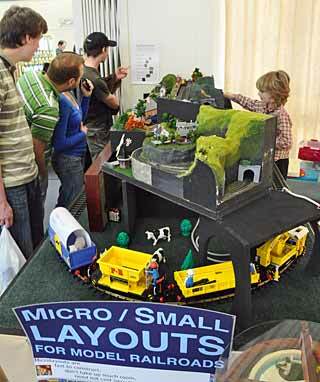 Notice that they titled the display, “Micro/Small Layouts for Model Railroads,” and used (with permission) the logo and graphics from this website to bring the whole story together. 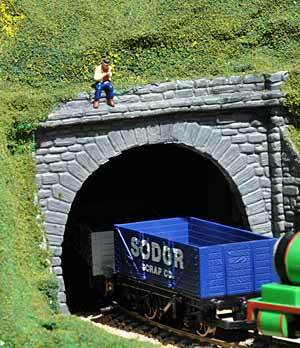 The newest layout, Squiffy-Waterton, is a 81×23½in HO/OO line designed to be portable and to fit easily through doorways. 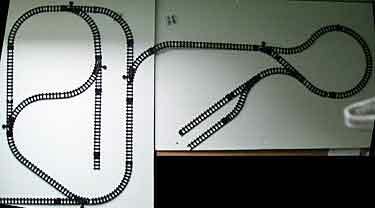 It is also designed to have one of each type of track section — left points, right points, Y-point, curved point, 3-way point and double slip. It offers continuous and end-to-end operations. Jonathan and Edwin built it especially for this exhibition and describe the experience on the Scott website. 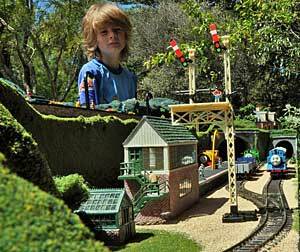 The layout is designed as a playground for Thomas the Tank Engine and his friends. 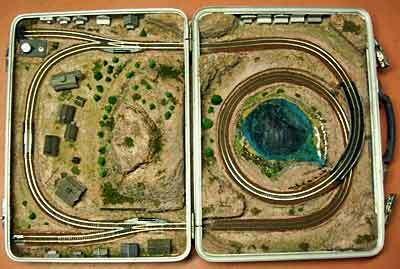 Jonathan explains, “There is a loop [passing siding] on the bottom, with a passing loop and shunting yard on one side, and a single station on the other side (brown tracks). On the top is a passenger station, the Squiffy-Waterton of the name, as well as two industrial stations and an engine works shed (blue). The layout is named Squiffy-Waterton because it is a recently-created site like Great Waterton in Thomas’s world of Sodor, but it is designed to be small, hence the very-British sounding Squiffy. The Waterton is Edwin’s contribution, and Squiffy is Jonathan’s. The lower stations are Waterton Docks and Passing Waterton” [an outrageous pun from Jonathan’s wife, Kay]. THIS ITALIAN INTERURBAN LINE IS BEING BUILT IN BERLIN! Alexander Kaczmarek, from Berlin, Germany, awhile back set out to build a small HO switching shelf, Mainlände (Scrapbook #82a). But somewhere in the journey things started to change… Says Alexander, “Hmmm…but H0 is really tiny, isn´t it? So I switched to 0n30… Okay…but only switching…no loop, no circle? Some train running is needed too. So I rebuilt the layout with a circle and a loop. Now it is an interurban station somewhere in Northern Italy. Mainlände transformed to Stazione Montelupo. The radii are very tight, but large enough for the Bachmann streetcar and short 4-wheelers. As usual I am building the houses from styrofoam and cardboard. Bella Italia!” We’ll keep you posted on future developments, folks! Martin Hogg, from Mansfield, England, really makes it look easy. 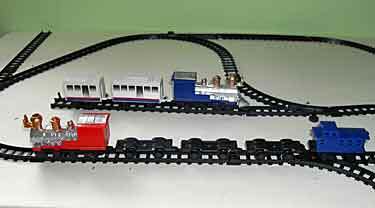 He says, “I really wanted something that I could set up quickly and have a bit of fun switching, and possibly let ’em run—a train set! So, using this spare 4x2ft [120x60cm] board, I hot-glued some Kato N track down. The very basic greenery is about all I can fix permanently as this layout lives under the settee. The buildings are eBay purchases and stored in a seperate box. I hope to complete a high street scene in the centre and get some trees to fill some open space. MJ Idzerda, from London, Ontario, Canada, is working on this 6x1ft [180x30cm] HO trolley line, which also weaves through lovely scenery in a continuous loop. It’s called the Pine Lake Trail Trolley Co. We’ll keep you posted! 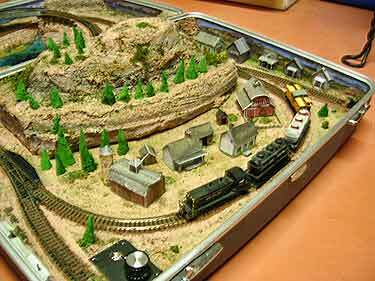 Mike Scearce, from Indianapolis, Indiana, USA, built this “layout in a suitcase” as an eleventh birthday present for his grandson, Christopher (Bubby) Scott. Mike declares, “I haven’t seen a suitcase layout that passes through to the lid portion, doubling the usable area. I just made this one for my grandson out of a $1 Garage Sale suitcase. 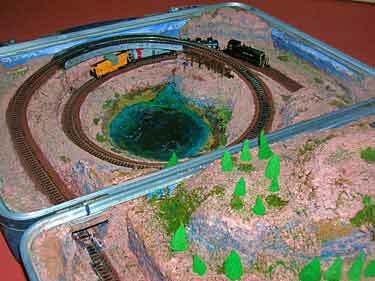 “It has two sidings and a up-and-over loop around a crater lake. The lake is only ½in deep but looks bottomless. The mountain on the other half nests into the lake when closed. I put a ranch with barns and bunkhouse in the center and old western ghost town around the sides. 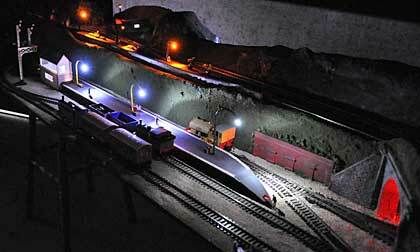 Oh yeah, this is not Z scale, it is N scale. It will run on a 9-volt battery but has a 12 volt ac power plug nested in the storage area beneath the tilt up mountain.” Mike shot a home-made video of the layout in action. You can see it by clicking the arrow below… note, there is no sound track on this clip. These candid shots show a circular exhibition layout constructed by Briton Mark Ward. He may have been influenced by Keith Addenbrooke’s Double Circle Railway designs elsewhere on this site. Dave Barclay spotted the layout and took the photos. 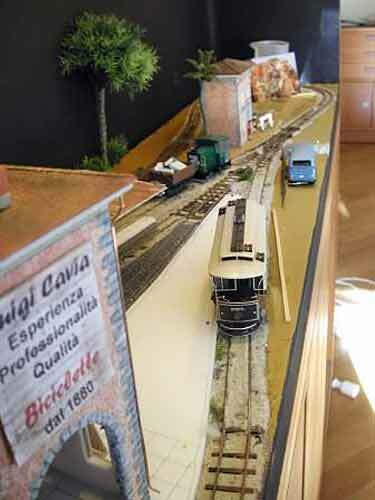 Russ Haigh, from Willoughby, Ohio, USA, recently retired and is now designing larger layouts… but still small, of course! This one is 2x4ft (60x120cm) and is succinctly described by Russ: “Got a copy of AnyRail over the weekend and this is what I came up with. Cavorite from mine to mill, loads-empties movement, continuous running and a hidden staging track. 5 percent grade from mine at Apache Creek up through the ridge and down to Pie Town. Uses Atlas N flextrack and Peco Setrack turnouts. Neat software.” And he’s now building it! 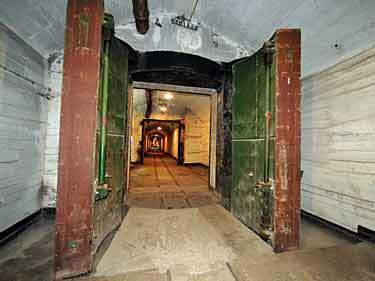 Throughout the Cold War, the city of Balaklava—on the Black Sea coast of the Crimea—was a super-secret place, hidden from the public eye. 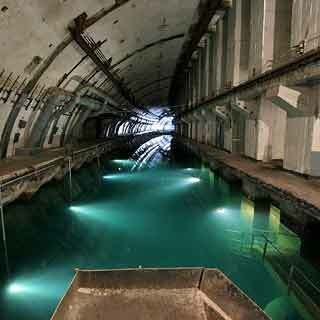 We now know it was a classified submarine base for the Soviet Union, from about 1945 to the early 1990s. 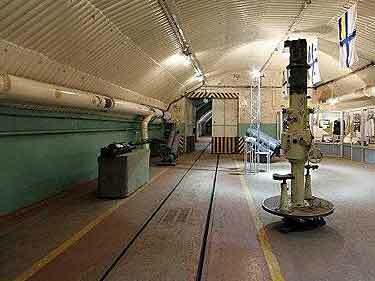 It’s now part of the Ukraine, who have opened the doors and made the place into a museum. And what a spot it is! From the hidden entrance (upper left), through the tunneled submarine channels (upper right) and into the vaulted rooms of the interior (below), it’s a place out of a James Bond movie… and there was a railroad serving the underground base! Who could ask for a more exciting prototype? 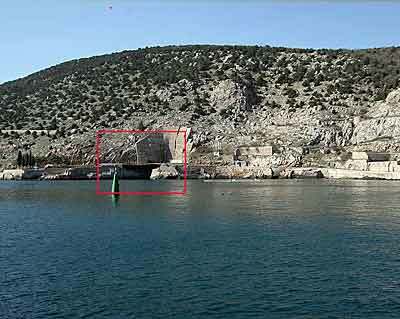 The narrow-gauge tramway appears to have been about 750mm [about 30in] gauge, and was used to haul supplies, parts, and probably torpedoes and other armaments from the storage areas to the sub workshops. These photos are a sampling of a large collection by Russian photographer Russo, available at the English Russia site. Ben Calcott, from Wellington, New Zealand, discovered this treasure trove and called it to my attention. If you want to dig deeper, there are more photos here and here. Naturally, I couldn’t resist having a go at designing a micro layout to capture some of the excitement of this secret submarine base! The result is shown above… On30/O16.5, it measures 40x12in (100x30cm) and is an oval with a couple of strategically placed sidings. The layout is broken into scenic displays, through which the trains meander from time to time. 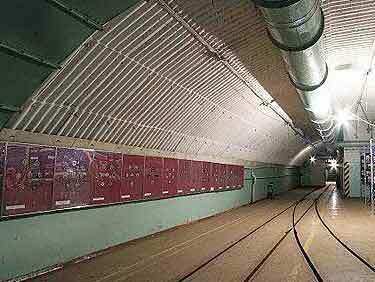 The first one, not affected by the trains, is the semi-concealed outside entrance to the base (top left). It’s a shallow cave in the cliff, with towering rocks on either side and above. I show the very tip of a submarine’s nose, for those who would like to have at least part of a naval model on the layout. One important reason for having a continuous circuit is to allow the spectator to bring his eye right down to trackside level and watch the train move toward him through those endless underground corridors. This can be done at the upper right (looking left), and at the lower left (looking right). 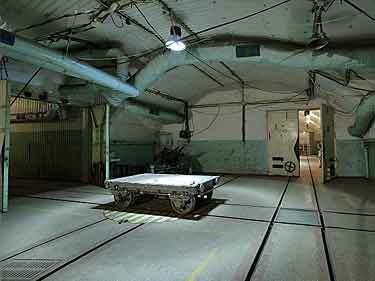 Two vaulted rooms are also included, one with a wagon turntable, the other with a turnout and working bulkhead door. The long, concealed spur is either a fiddle track (worked from the right-hand end using a Peco Loco Lift) or a cleverly staged “forced perspective” hallway, seeming to go on and on to infinity. Perhaps it could be both, depending on how you handle the mirrors! I’m not particularly satisfied with this “quick and dirty” design, and would welcome other people’s sketches and plans for micro layouts (less than four square feet in area) that capture the drama of this amazing prototype. All practical designs will be published. —Carl.